New TV for Your Business: No Better Time to Buy! Whether you own a Quick Serve Restaurant (QSR), or a classic sit-down style restaurant, a new TV could be just what you need to spice up your location; and there’s no better time than now to invest in one. This article will illustrate why now is a great time get a new TV for your business; as well as point you in the direction of where to start looking for a cost-effective TV solution that works for you. A New TV for your Business? Tis’ the Season! Black Friday… Cyber Monday… The weeks of sales and savings before, and after these well-known purchasing events are the best times to buy a TV. With the Thanksgiving holiday wrapping up, and the festive season just around the corner; prices for such things are as low as they’ve been all year. Need a TV for your business? Or a second TV to highlight a part of your restaurant that the first TV doesn’t reach? Now’s the time to think about browsing, and treating yourself to a new screen! Getting a TV is only half the battle. To get the most out of your new screen, you need something to put on it. Years ago, the general go-to for filling the screen was cable. However, as technology has evolved, new and innovative TV solutions now exist that are made for restaurant settings. So now that you’ve got your shiny new TV, you’ll need something great to put on it. Now before you consider settling for regular old cable, or even worse; Netflix, for your business’ TV entertainment solution, consider what those services are designed for. Cable TV is meant for the home-setting. Where friends and family sit down and watch TV, for the purpose of sitting down, and watching TV. That’s less-so the case in a restaurant, where folks are there to eat, or converse with one another. With how familiar cable is, it’s easy to see why so many businesses throw it on their screens – because what else is there? Alternatives to cable are out there, if you take the time to look. Alternatives that are made for businesses, and cost less than cable. One service in particular stands out above the rest. 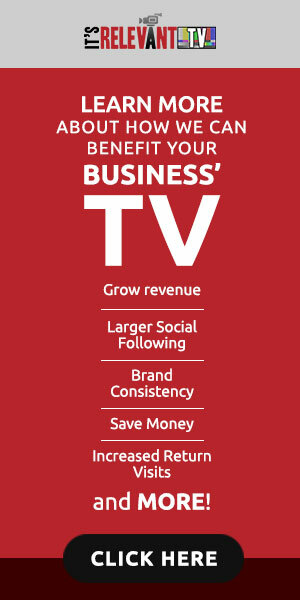 It’s Relevant TV is all you’ll ever need when it comes to business TV software. Combining the best aspects of television, and digital signage – It’s Relevant streams content from a library of over half-a-million videos; broken down into 40+ categories to pick and choose from. With the option of uploading your own personal ads and videos to play in between, or alongside IRTV’s interesting content. If you’re looking for a TV network with engaging, family-friendly content; one that you control, which can be spread across multiple TVs, then It’s Relevant is right for you. Don’t settle for a costly cable service that allows competitor ads into your business, not when digital signage solutions like It’s Relevant TV are an option. Are your Employees Watching TV at work? Television Decided the Election. What Decisions is it Making for Your Customers? Next Next post: Can You Replace Commercials on Cable or DirecTV?